Farrar, Straus and Giroux (BYR), 9780374347468, 32pp. Ideal for Easter and springtime, an exuberantly illustrated picture book by a New York Times bestselling artist! Little Chick's mother is all cluck and no action. Mama knows her old nest isn't the cozy home she and her brood need. But whenever she vows to start building a new house, she's distracted—by sweety-meaty worms, crunchy-munchy crickets, or picky-pecky corn. Luckily, her Little Chick is an industrious sort. While the rest of his family are stuffing themselves silly, he's quietly working, bit by bit, day by day. 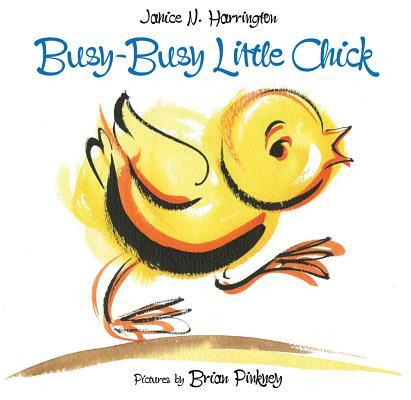 Janice N. Harrington's retelling of a little-known Central African story is perfectly matched with Brian Pinkney's jazzy depiction of a can-do little critter. Janice N. Harrington grew up in Vernon, Alabama. When she was eight years old, her family moved to Lincoln, Nebraska. A lover of stories both written and oral, she came to her interest in writing through childhood favorites such as Jane Eyre, Charlotte’s Web, and the Greek myths she came upon in an antiquated set of the Book of Knowledge encyclopedia. Ms. Harrington received the Ezra Jack Keat’s New Writer Award for her first picture book, Going North. The book, which Kirkus Reviews called “gorgeous,” and School Library Journal described as “a solid choice for readers,” was named a Bulletin of the Center for Children’s Books Blue Ribbon Book, a Kirkus Reviews Editor’s Choice, and a Booklist Editors’ Choice. Her second picture book, The Chicken-Chasing Queen of Lamar County, has already received much acclaim, being selected for Fanfare, The Horn Book’s Honor List and named a Kirkus Reviews Editor’s Choice. Ms. Harrington is also a nationally known storyteller who has been featured at the National Storytelling Festival, a widely published poet, and a children’s librarian with over twenty-two years’ experience as a youth advocate. She lives in Champaign, Illinois. Acclaimed artist Brian Pinkney is the illustrator of several highly-praised picture books including The Faithful Friend, In the Time of the Drums, and Duke Ellington. He is a graduate of the University of the Arts in Philadelphia, Pennsylvania, and holds a master's degree in illustration from the School of Visual Arts in New York City. He lives in Brooklyn, New York with his wife Andrea, with whom he often collaborates, and his two children. His and Andrea's latest collaboration, Sit-In: How Four Friends Stood Up by Sitting Down, was on the New York Times bestseller list for three weeks. He has been published by Greenwillow Books, Hyperion Books for Young Readers, Harcourt Children's Books, Simon & Schuster, and Random House. His work has also appeared in New York Times Magazine, Women's Day, Business Tokyo, Ebony Man, and Instructor. “Harrington's (Roberto Walks Home) storytelling background and careful investigation of African sources can be seen in the multitude of sound words and Lonkundo vocabulary she includes. Watching Little Chick succeed where his parent has stumbled will thrill young readers.” —Publishers Weekly.